Article: Asia Monet Ray Looked Gorgeous At The Nail Garden Studio City 10 Year Anniversary Party! It’s always an amazing thing to get a nice mani / pedi, and it’s even more of a wonderful thing when it is benefiting a great cause! 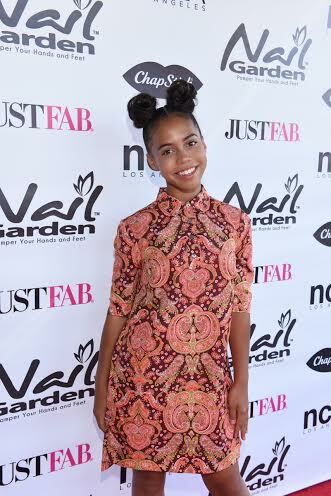 The effervescent and magnificently talented Asia Monet Ray looked so stunning and marvelous as she attended the Nail Garden Studio City 10 Year Anniversary Party Summer Toy Drive Benefiting Mattel Children’s Hospital UCLA on July 26, 2016. The wonderful Asia Monet Ray looked super stylish, as always, in a sensational, paisley-patterned dress. Such a beautiful fashionista she is! The lovely Asia Monet Ray had a terrific time at the event and shared the fabulous photo as seen below through her Instagram account. Asia Monet Ray also enjoyed her time catching up with her friends Rio Mangini and Sloane Morgan Siegel at the event as seen in the awesome photo she shared through her Instagram account. I’m so glad Asia Monet Ray had an exceptional time at the event! Be sure to check out my updated VIPAccessEXCLUSIVE interview with Asia Monet Ray below. Next Article: Monty Geer Looked Super Cool And Had Fun At The Nail Garden Studio City 10 Year Anniversary Party!